July is the month where things step up to manic levels at the business and also within our homes, because the show season is upon us. It takes an awful lot of planning and preparations to get all our wonderful goodies to different shows around the country. Our staff are brilliant and go above and beyond to help execute the military plans to transports all the wellies, coats and clothing to different venues. This year we have four shows, the first two are back to back; the The Game Fair (29th – 31st of July) and the Countryfile Live show (4th – 7th of August). The other two shows that we will be going to later on in the year are the Chatsworth Country Fair (2nd – 4th of September) and the Midland Game Fair (17th – 18th of September), so we have time for a little bit of rest in between. 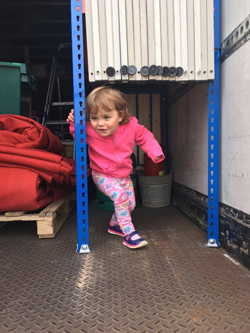 Show season is always an exciting time, especially this year, because we are taking two show stands, and we have bought a huge lorry to get everything in! We will also be taking our trusty Philip Morris and Son van too. (How could we possibly leave it behind!). The lorry has been at the farm over the last month and so, of course, we had to go and explore it. Little Miss and I spent the weekend preparing food for all the guys and girls going to the shows and tomorrow evening, I will be making the cakes and goodies to fill the busy selling days. 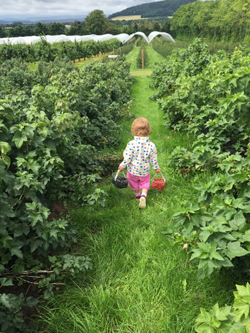 We also had a family holiday at the beginning of the month where we had adventures and went exploring around Herefordshire. There is just so much to do right on our doorstep that we decided a ‘staycation’ was a sensible option, especially as baby Jones #2 is due later this year. 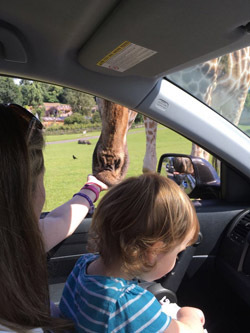 So with our picnic backpack packed we headed to West Midland Safari Park for the day. This just so happened to coincide with toilet training Willow, a bit risky but hey-ho nothing ventured nothing gained. As it happens our Little Miss is a pro at using public toilets and her potty in the most unusual places, and so no accidents occurred. Willow and I have a thing about giraffes and so when we were able to feed one during our excursion this led to a car full of giggles and excitement, and not just from Willow. Our holiday also saw us go to the ‘Jump In Gym’ at Halo. We have never been able to take Willow there before due to her prematurity and the need to keep her away from others, but now she is a fully fledged two-year-old so we thought we would risk it. 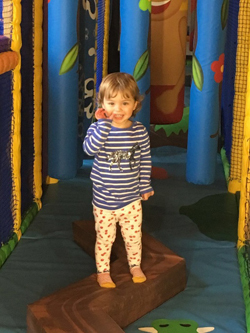 My little girl is definitely a little risk taker, by ignoring the ‘keep your socks on rules’ she learnt the hard way that sticky feet on plastic slides don’t really mix. However, she had a lovely time and slept so well that evening. Her ability to fall, trip or stumble and land on her face continued after a trip to Queenswood where she managed to slip again. The staff there were wonderful and offered a lot of help, but Little Miss just dusted herself down and continued on her way with the help of a ham sandwich and hot chocolate (for mummy and daddy). We must have been in a jovial mood during our holiday, as we also risked the swimming pool; another place we have avoided for the last year due to her chest. However, she had the best time in the leisure pool laughing and giggling at the wave machine. 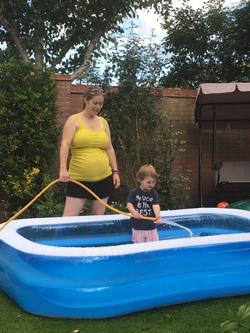 The best thing of all was the water shoots that poured water into the pool, imagine that, spraying water and a two-year-old! So much fun. However, this has led to her thinking the hose pipe is a great device for spraying everyone in the garden. The dogs love it, the cats? Ummm… not so much. Our final couple of days were filled with a visit to Tillington Court PYO, a favourite place of mine, and now it appears of Willow’s too. Willow loves tractors and was filled with delight when she saw that a tractor was busy working in the same field that we were walking through (plus there were strawberries growing). Now, my little monster is a fruit fiend; she loves nothing more than ploughing her way through plates full of fruit each day. 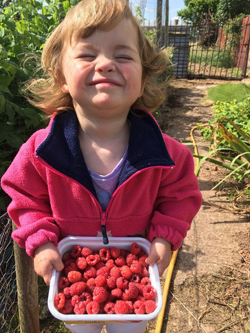 Poor Granny’s raspberry patch was made the destination of choice on every visit over the last month. Our holiday fun continued by going to the Dean Forest Railway and then to the Steam Fair at Much Marcle. As a family we love steam trains. Ok the husband thinks I am mad, but growing up with steam trains, planes and F1 cars were my heaven, so I am passing the love onto Willow. Yes she thinks F1 cars are tractors but hey, she will get there in the end. 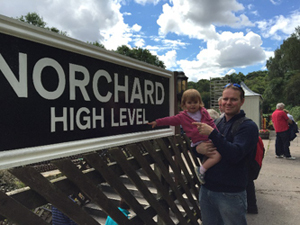 The Dean Forest Railway is amazing and there’s so much fun for little ones. This was her first train ride and it was on steam, what better introduction could she have had? 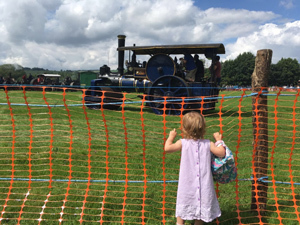 She did amuse (cough cough) all the other passengers in our carriage by exclaiming loudly ‘choo choo’ every other minute on the train ride and replicated this enthusiasm in the field when the engines paraded round. So the end of the month will be taken up with Mr Jones going up and down the country with the shows and talking endlessly about stock. But that’s ok, as there are still two more Game Fairs in September that need planning and organising, and anyway who doesn’t want to talk about wellies and coats in this glorious weather we seem to be having? Whatever you are doing for you hollibobs, enjoy and relax. Life is busy enough to make holidays stressful. Blenheim Palace, Chatsworth Country Fair, Chatsworth House, Countryfile Live, Dean Forest Railway, Family Holiday, Forest of Dean, Halo, hereford, Herefordshire, Midland Game Fair, Much Marcle, Pick Your Own, Queens Wood, Ragley Hall, Steam Fair, The Game Fair, Tillington Court Farm, West Midland Safari Park, Weston Park. Bookmark.